Home > Community > Sneak Peek > The May Box Is Just What You Need To Savor Every Moment! With 2017 almost halfway through, we find ourselves thinking how quickly the year is going by and with this, May’s box theme is “Savor Every Moment”. In the blink of an eye, the moments we create with our friends, family and loved ones can rapidly turn into memories. With so many celebrations going on this month, whether you’re celebrating the awesome mother in your life, the season changing or living deliciously gluten-free in honor of Food Allergy Awareness, we’ve made sure that our May box won’t let your taste buds down! With that, we bring back our photographer and videographer extraordinaire Katie to give you all a Sneak Peek at what’s coming to you this May! 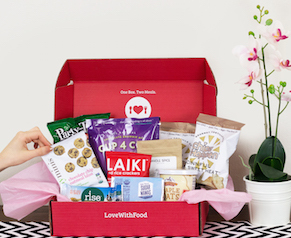 What's in the Love With Food MAY '17 Box? SPOILERS! Congrats to our April Sneak Peek winner! Thanks so much to Kristine P.! We completely agree that it’s important to have a work-life balance and making time for your family 🙂 You’ve got a snack box coming to you soon! Want to be our May winner? It’s easy! 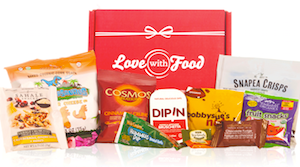 Just tell “Who will you bring to Las Vegas?” One winner will win a box of Love With Food snacks!